Found in the depths of some German forum, a DPreview member says these pictures are for the yet-to-be-announced Canon EOS 5D Mark II. 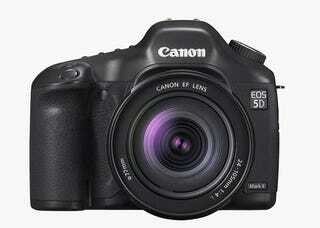 No real details to this camera other than the fact that it's going to replace the 5D (obviously). See the back after the jump, but don't expect a "make me a professional photographer" button or anything.